Quincy C. Hilliard’s compositions for wind band are published by a variety of well known publishers. In 2014, Hilliard received the prestigious Mississippi Institute of Arts and Letters Award in the Classical Music Division. He was also recognized with a second Global Music Award for his work as a composer. In 2012, one of his pieces, Coty (clarinet and piano) was recorded on a CD that was nominated for a Grammy Award. In 2008, he was commissioned by the Library of Congress to compose a work in celebration of the bicentennial of the birth of Abraham Lincoln. He is frequently commissioned to compose works, including one for the 1996 Olympic Games in Atlanta and a score for a documentary film, The Texas Rangers. For many years, the American Society of Composers, Authors, and Publishers (ASCAP) has recognized him with annual awards for the unusually frequent performance of his compositions. Hilliard is regularly invited to conduct, demonstrate effective techniques, and adjudicate festivals throughout the world. Because Hilliard, the composer, conductor, and educator, is also a scholar of Aaron Copland’s music and life, Copland estate administrators authorized Hilliard to publish the educational performance edition, Copland for Solo Instruments (Boosey and Hawkes, 1999). To train school band students, he wrote Superior Bands in Sixteen Weeks (FJH Music Company, 2003), Chorales and Rhythmic Etudes for Superior Bands (FJH Music Company, 2004), Scales and Tuning Exercises for Superior Bands (FJH Music Company, 2009), Theory Concepts, Books One and Two and is the co-author of the Skill Builders, Books One and Two (Sounds Spectacular Series, Carl Fischer, 1996). He is also the co-author of Percussion Time (C.L. Barnhouse Company) which is a collection of music written specifically for the beginning percussion ensemble. He has presented scholarly papers on music theory and analysis at meetings of the College Music Society and the Central Gulf Society of Music Theory (of which he is past president). He has published articles in Opera Journal, The Instrumentalist, School Musician, Bandworld, American Music Teacher, Florida Music Director, and Tennessee Musician. Currently, Hilliard holds the position of Composer in Residence and is the Heymann Endowed Professor of Music at the University of Louisiana, Lafayette. Previous teaching positions were at Nicholls State University, Florida International University, North Marion High School (Sparr, Florida) and White Station Junior and Senior High School (Memphis, Tennessee). He holds the Ph.D. in music theory and composition from the University of Florida where, in 1999, he was recognized as the Outstanding Alumnus of the School of Music. He holds the Masters of Music Education from Arkansas State University and the Bachelor of Science in Music Education from Mississippi State University where he was designated College of Education 1998 Alumnus of the Year. Hilliard’s early music experience was as a trumpet player in the public elementary and high school of his native Starkville, Mississippi. 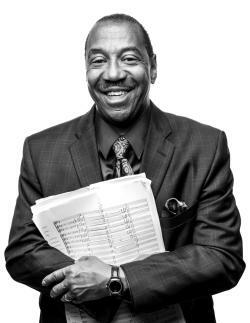 Dr. Hilliard is also president of Hilliard Music Enterprises, Inc. a personal consulting firm, which has a corporate board of distinguished music educators. He and his wife Rubye have two sons. A HOLIDAY FESTIVAL (Concert Band), published by Counterpoint Music Publishers, Jonesboro, AR, 1993. AFRICAN FESTIVAL w/Elledge and Pearson (Concert Band), published by Kjos Music Publishers, San Diego, CA, 1999. ALPINE OVERTURE (Concert Band), published by Macie Music Publishers, Dallas, TX, 1997. AN ORIENTAL HYMN (Concert Band), published by FJH Music Company, Ft. Lauderdale, FL, 2000. AUTUMN LULLABY (Concert Band), published by FJH Music Company, Ft. Lauderdale, FL, 2000. BLUE BUS WORKSHOP (Concert Band), published by Print Music Sources, San Antonio, TX, 2016. BRIDGEWAY MARCH (Concert Band), published by FJH Music Company, Ft. Lauderdale, FL, 2001. CHESAPEAKE MARCH w/Elledge (Concert Band), published by Kjos Music Publishers (Best in Class Series), San Diego, CA, 1988. CHOO CHOO BLUES (Concert Band), published by Macie Music Publishers, Dallas, TX, 1987. CHORALES FOR BEGINNING AND INTERMEDIATE STRING OR FULL ORCHESTRA (Orchestra), published by Kjos Music Publishers, San Diego, CA, 2000. CHORALE NO. 1 (Concert Band), published in the Bandworld, January-February, 1989, Vol. 4, No. 3. CHORALE NO. 1+ (Concert Band), published in the Bandworld, January-February, 1992, Vol. 7, No. 3. CHORALE NO. 2 (Concert Band), published in the Bandworld, January-February, 1993, Vol. 4, No. 3. CLOVERLEAF WALTZ (Concert Band), published by Macie Music Publishers, Dallas, TX, 1987. CLING CLANG CONCERTO (Concert Band), published by FJH Music Company, Ft. Lauderdale, FL, 2000. COMMANDO MARCH (Concert Band), published by Macie Music Publishers, Dallas, TX, 1997. EAGLE COMMAND MARCH (Concert Band), published by Carl Fischer Music Publishers, New York, NY, 1991. ECHO LAKE POEM (Concert Band), published by Counterpoint Music Publishers, Jonesboro, AR, 1994. EIGHT CHORALES FOR ELEMENTARY BAND (Concert Band), published by FJH Music Company, Ft. Lauderdale, FL, 2004. EL ALACRÁN (Concert Band), published by Print Music Sources San Antonio, TX, 2017. EL TIGRE (Concert Band), published by Counterpoint Music Publishers, Jonesboro, AR, 1992. EMBERWOOD (Concert Band), published by FJH Music Company, Ft. Lauderdale, FL, 2000. ENERGICO (Concert Band), published by Band Music Press, Chicago, IL, 1997. FOUR OF A KIND (Concert Band), published by FJH Music Company, Ft. Lauderdale, FL, 2001. FUNDAMENTALS FOR ENSEMBLE DEVELOPMENT (Concert Band), published by Print Music Sources San Antiono, TX, 2015. GROOVIN' (Concert Band), published by Macie Music Publishers, Dallas, TX, 1987. HOLIDAY CANON (Concert Band), published by Print Music Sources San Antiono, TX, 2015. JOYOUS HOLIDAY (Concert Band), published by Ludwig Music Company, Grafton, OH, 2006. KINGSRIDGE (Concert Band), published by Carl Fischer Music Publishers, 1992. LITTLE CHIEF (Concert Band), published by Macie Music Publishers, Dallas, TX, 1987. LOW BRASS BLUES (Concert Band), published by Counterpoint Music Publishers, Jonesboro, AR, 1993. PARAGON (Concert Band), published by Southern Music publishers, San Antonio, TX, 1992. PRELUDE AND DANCE (Concert Band), Published by Counterpoint Music Publishers, Jonesboro, AR, 1994. PRIDE OF THE BELLS MARCH (Concert Band), published by TRN Music Publishers, Rudioso, NM, 2011. ON GOLDEN SPIRITS (Concert Band), published by Carl Fischer Music Publishers, New York, NY, 1998. RAVENWOOD (Concert Band), published by Carl Fischer Music Publishers, New York, NY, 1997. SAMURAI (Concert Band), published by FJH Music Company, Ft. Lauderdale, FL, 2002. SEASON’S GREETINGS (Concert Band), published by FJH Music Company, Ft. Lauderdale, FL, 2000. SOULMATE (Concert Band), published by Carl Fischer Music Publishers, New York, NY, 1994. SPIRITUAL CHRISTMAS (Concert Band), published by Ludwig Music Company, Grafton, OH, 2005. SUKURA (Concert Band), published by C. L. Barnhouse Music Publishers, Oskaloosa, IA 2006. TEN CHORALES FOR BEGINNING AND INTERMEDIATE BAND (Concert Band), published by Kjos Music Publishers, San Diego, CA, 1993. TERZETTO HARMONIUM (Chamber Work), published by Macie Music Publishers, Dallas, TX, 1992. THE LITTLE CAROUSEL (Concert Band), published by Ludwig Music Company, Grafton, OH, 2004. THUNDERCREST (Concert Band), published by FJH Music Company, Ft. Lauderdale, FL, 2002. VOLKSLIED VARIATIONEN (Chamber Work), published by Macie Music Publishers, Dallas, TX, 1992. DRIFTING SHADOWS (Chamber Work), published by Macie Music Publishers, Dallas, TX, 1994. ARABIC DANCE (Concert Band), published by Print Music Sources San Antiono, TX, 2015. ACADIAN FESTIVAL (Concert Band), published by Carl Fischer Music Publishers, New York, NY, 1992. ADAGIO FOR WINDS (Concert Band), published by Counterpoint Music Publishers, Jonesboro, AR, 1994. AFRICATA (Concert Band), published by FJH Music Company, Ft. Lauderdale, FL, 2002. AUSTRALIAN FESTIVAL (Concert Band), published by Counterpoint Music Publishers, Jonesboro, AR, 1998. CALICO (Concert Band), published by Carl Fischer Music Publishers, New York, NY, 1997. CANAL STREET FESTIVAL (Concert Band), published by Ludwig Music Company, Grafton, OH, 2006. CENTER STAGE MARCH (Concert Band), published by TRN Music Publishers, Rudioso, NM, 2015. CHILDREN OF THE SUN (Concert Band), published by TRN Music Publishers, Rudioso, NM, 2012. CONCERTO OR YOUNG ARTIST AND BAND (Solo and Concert Band) published by Carl Fischer Music Publishers, New York, NY, 1999. ENCORE (Solo and Piano) published by Carl Fischer Music Publishers, New York, NY, 1999. ESPRESSIONISTA (Concert Band), published by Print Music Sources Publishers, San Antonio, TX, 2016. FUEGO DE LA PASIÓN (Concert Band), published by Print Music Sources Publishers, San Antonio, TX, 2017. FUNDAMENTALS FOR ENSEMBLE DRILLS (Beginning Band), published by Print Music Sources, San Antonio, TX, 2015. GLASS REFLECTIONS (Concert Band), published by Ludwig Music Company, Grafton, OH, 2004. DAY OF DRAGON (Concert Band), published by Carl Fischer Music Publishers, New York, NY, 1996. DANCE (Concert Band), published by Print Music Sources San Antiono, TX, 2015. ESSAYS ON AN AMERICAN HYMN (Concert Band), published by Carl Fischer Music Publishers, New York, NY, 1994. IRISH FESTIVAL (Concert Band), published by FJH Music Company, Ft. Lauderdale, FL, 2003. JAPANESE FESTIVAL (Concert Band), published by Carl Fischer Music Publishers, New York, NY, 1997. KOREAN FESTIVAL (Concert Band), published by Boosey & Hawkes Music Publishers, New York, NY, 1987. LAKESIDE (Chamber Work), published by Macie Music Publishers, Dallas, TX, 1992. LAKESIDE OVERTURE (Concert Band), published by Print Music Sources San Antiono, TX, 2014. LOS BANDITOS (Concert Band), published by C. L. Barnhouse Music Publishers, Oskaloosa, IA 2002. LITTLE CHAMP Mesang/Hilliard (Concert Band), published by Carl Fischer Music Publishers, New York, NY, 2001. LYRICO FOR WINDS w/Carlos Cody (Concert Band), published by RBC Music Publishers, San Antonio, TX, 1993. MAJESTIC DANCE (Concert Band), published by Counterpoint Music Publishers, Jonesboro, AR, 1995. MARCH OF THE SILVER BRIGADE (Concert Band), published by Counterpoint Music Publishers, Jonesboro, AR, 1997. MARCH OF THE THIRD BATTLETION (Concert Band), published by Northeastern Music Publishers, Philadelphia, PA, 2010. NIGHT HAWK (Chamber Work), published by Macie Music Publishers, Dallas, TX, 1992. NORTH PENN CELEBRATION (Concert Band), published by Carl Fischer Music Publishers, New York, NY, 1993. ...on the dawn of a new sunrise (Concert Band), published by Educational Program Publications, St. Louis, Missouri, 2001. PINECREST (Concert Band), published by Northeastern Music Publishers, Philadelphia, PA, 2012. PORTRAITS IN TIME (Concert Band), published by Carl Fischer Music Publishers , New York, NY, 1994. RIVERSTONE RIDGE (Concert Band), published by Carl Fischer Music Publishers, New York, NY, 1997. ROAD TO FREEDOM (Concert Band), published by Ludwig Music Company, Grafton, OH, 2012. SHADOWS IN TIME (Concert Band), published by FJH Music Company, Ft. Lauderdale, FL, 2003. SUNDANCE (Concert Band), published by Southern Music Publishers, San Antonio, TX, 1991. SYMBOL OF HONOR Mesang/Hilliard (Concert Band), published by Carl Fischer Music Publishers, New York, NY, 1997. TELSTAR (Concert Band), published by Counterpoint Music Publishers, Jonesboro, AR, 1997. THE DARK CRYSTAL (Concert Band), published by Northeastern Music Publishers, Philadelphia, PA, 2008. THE GATHERING OF THE KNIGHTS (Concert Band), published by Ludwig Music Company, Grafton, OH, 2004. THE LAST ROSE OF SUMMER (Concert Band), published by Ludwig Music Company, Grafton, OH, 2005. THE ORGANIZER MARCH (Concert Band), published by Harold Gore Music Publishers, Denton, TX, 1994. TRIBUTE TO EXCELLENCE (Concert Band), published by Harold Gore Music Publishers, Denton, TX, 1996. VALLEY JUNCTION PORTRAIT (Concert Band), published by Counterpoint Music Publishers, Jonesboro, AR, 1992. VOICES OF THUNDER (Concert Band), published by Ludwig Music Company, Grafton, OH, 2009. WINDS OF ANGER (Concert Band), published by Counterpoint Music Publishers, Jonesboro, AR, 1997. A GRUNDMAN TRIBUTE (Concert Band), published by Boosey & Hawkes Music Publishers, New York, NY, 1997. A SALUTE TO COURAGE (Concert Band), published by Educational Program Publications, St. Louis, Missouri, 2000. AMERICAN SAGA (Concert Band), published by Counterpoint Music Publishers, Jonesboro, AR, 1994. BULL FIGHTER (Chamber Work), published by Macie Music Publishers, Dallas, TX, 1992. CHANT CEREMONIUM (Concert Band), published by Daehn Publications New Glarus, WI, 2011. CHING-A-RING-CHAW (Chamber Work) Copland/Hilliard, published by Boosey & Hawkes Music Publishers, New York, NY, 2000. COMMUNIO (Concert Band), published by Kjos Music Publishers, San Diego, CA, 2010. CRESTWOOD OVERTURE (Concert Band), published by Bourne Music Company, New York, NY, 1984. CRYSTAL CATHEDRAL (Concert Band), published by Counterpoint Music Publishers, Jonesboro, AR, 1999. DANCE OF FIRE (Concert Band), published by Counterpoint Music Publishers, Jonesboro, AR, 1993. FIRECREEK LEGACY (Concert Band), published by Carl Fischer Music Publishers, New York, NY, 1993. HOEDOWN (Concert Band) Copland/Hilliard, published by Boosey & Hawkes Music Publishers, New York, NY, 1997. I BROUGHT ME A CAT (Chamber Work) Copland/Hilliard, published by Boosey & Hawkes Music Publishers, New York, NY, 2000. IN PRAISE OF AUTUMN (Concert Band), published by C. L. Barnhouse Music Publishers, Oskaloosa, IA, 1986. LIGHTS OF THE UNKNOWN (Concert Band), published by Print Music Sources, San Antonio, TX, 2016. KYOTO (Concert Band), published by Kjos Music Publishers, San Diego, CA 2006. MEXICAN FESTIVAL (Concert Band), published by Carl Fischer Music Publishers, New York, NY, 1994. OCTANE (Concert Band), published by Kjos Music Publishers, San Diego, CA 2015. OUT OF DARKNESS (Concert Band), published by C. L. Barnhouse Music Publishers, Oskaloosa, IA 2004. OVATION (Concert Band), published by Harold Gore Music Publishers, Denton, TX, 1994. SEA STORM (Concert Band), published by Kjos Music Publishers, San Diego, CA 2002. THE FORBIDDEN CAVERNS (Concert Band), published FJH Music Company, Ft. Lauderdale, FL, 2001. THE PLACE WHERE THE REEDS WERE DESTROYED (Concert Band), published by Kjos Music Publishers, San Diego, CA, 1997. TOAST TO HONOR MARCH (Concert Band), published by TRN Music Publishers, Rudioso, NM, 1988. TWELVE CHORALES FOR DEVELOPING BAND (Concert Band), published by FJH Music Company, Ft. Lauderdale, FL, 2001. VARIATIONS ON AN AFRICAN HYMNSONG (Concert Band), published by C. L. Barnhouse Music Publishers, Oskaloosa, IA 1994. VIVA LA MEXICANA (Concert Band), published by Northeastern Music Publishers, Philadelphia, PA, 2012. WARRIORS OF PREY (Concert Band), published by Carl Fischer Music Publishers, New York, NY, 1999. ZION'S WALLS (Chamber Work) Copland/Hilliard, published by Boosey & Hawkes Music Publishers, New York, NY, 2000. ANTHEM FOR VICTORY (Concert Band), published by Carl Fischer Music Publishers, New York, NY, 1996. BILLY THE KID (Concert Band) Copland/Hilliard, published by Boosey & Hawkes Music Publishers, New York, NY, 2000. BRITISH EIGHTH - Zo Elliott edited by Quincy Hilliard (Concert Band) published by Carl Fischer Music Publishers, New York, NY, 2000. FURIOSO (Concert Band), published by Bourne Music Company, New York, NY, 1981. PRIMO (Concert Band), published by TRN Music Publishers, Rudioso, NM, 2015. REQUIEM (Concert Band), published by TRN Music Publishers, Rudioso, NM, 1990. THE DAY THE CLOWNS CRIED (Concert Band), published by Northeastern Music Publishers, Philadelphia, PA, 2008. UNIVERSAL COVENANT (Concert Band) - published by Carl Fischer Music Publishers, New York, NY, 2000. GHOST DANCE (Concert Band), published by Boosey & Hawkes Music Publishers, New York, NY, 1996. THE UNKNOWN SOLDIER (Concert Band), published by Kjos Music Publishers, San Diego, CA 2002. SPIRIT OF SURVIVAL (Concert Band), published by Kjos Music Publishers, San Diego, CA, 2005. FANFARE FOR FREEDOM (Concert Band), published by Kjos Music Publishers, San Diego, CA 2009. DRIVEN!! (Concert Band), published by Northeastern Music Publishers, Philadelphia, PA, 2010. Hilliard, Quincy C. Scales and Tuning Exercises for Superior Bands. FJH Music Company: Ft. Lauderdale, 2009. Hilliard, Quincy C. Superior Bands in Sixteen Weeks. FJH Music Company: Ft. Lauderdale, 2003. Hilliard, Quincy C. Chorales and Rhythm Etudes for Superior Bands. FJH Music Company: Ft. Lauderdale, 2004. Hilliard, Quincy C. and Joseph P. D’Alicandro, Jr. Percussion Time. C.L. Barnhouse Company: Oskaloosa, IA. 2004. Hilliard, Quincy C. Theory Concepts Book I (Sounds Spectacular Series). Carl Fischer: New York, 1994. Hilliard, Quincy C. Theory Concepts Book II (Sounds Spectacular Series). Carl Fischer: New York, 1994. Hilliard, Quincy C. and Balent, Andrew. Skill Builders Book II (Sounds Spectacular Series). Carl Fischer: New York, 1993. Hilliard, Quincy C. and Balent, Andrew. Skill Builders Book I (Sounds Spectacular Series). Carl Fischer: New York, 1992. Copland 2000, Published by Boosey & Hawkes Music Publishers, New York, NY, 1999. Books are published for the following instruments: Violin, Viola, Cello, Double Bass, Flute, Oboe, Bassoon, Clarinet, Alto Saxophone, Tenor Saxophone, Baritone Saxophone, Bass Clarinet, Trumpet, Horn, Trombone, Baritone, Tuba, Mallet Percussion. The Beginning and Middle School Band: Structuring Your Program for Success!! Teaching from the Inside-Out, A Composer's Viewpoint!